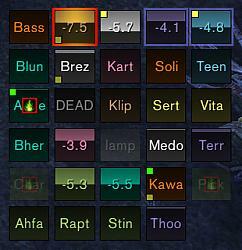 Grid is a compact and highly configurable party/raid unit frame addon. The compact grid of unit frames lets you select a group member quickly, while keeping a good overview of the whole group. It shows as much information as possible without overloading you. It allows you to customize what information you see, and how you see it. It works in both party and raid groups, and supports pets and vehicles. Want more features? The Grid core tries to include only features which are generally useful for all classes and roles, but makes it easy to add new features with a simple plugin API for developers. Over 75 third-party plugins are already available! 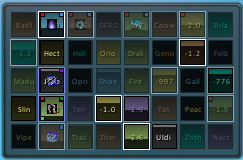 Type “/grid” for options, or right-click the minimap button, DataBroker launcher, or Grid frame tab. Grid is compatible with all World of Warcraft localizations. It is currently translated into English, Deutsch, Español, Français, Italiano, Português, Русский, 한국어, 简体中文, and 繁體中文. To add or update translations for any language, enter them on the WowAce project page. New and updated translations will be automatically included in the next version of Grid! HINT: The WowAce interface for adding translations is quite cumbersome. To make the process easier, you can use the Export function on WowAce, copy the exported data into your text editor, fill in your translations, and then paste them back into WowAce using the Import function. Grid was originally conceived and written by Maia and Pastamancer in late 2006. Phanx has been the primary developer since late 2009. Jerry wrote the original pet support code. Mikk designed the icon. jlam added some advanced options for auras. Greltok has helped a lot with bugfixing. Finally, lots of people have contributed translations! Thanks Attict, acastle, doadin, MGramolini, and rherzfeld for your help! The default statuses for Grace, Earth Shield, Eternal Flame, Sacred Shield, and Weakened Soul have been removed, since these buffs (and debuff) were removed from the game. New statuses have been added for Atonement, Beacon of Faith, and Clarity of Will. Marked code for splitGroups as debug in Layouts because the option is marked as debug. Should fix odd behavior for people who had option enabled before the option was disabled. For change notes from older versions, see the Version History page on GitHub. Last edited by vsek : 08-20-18 at 11:50 PM. This is caused by your UI Scale setting (for WoW as a whole; it's not specific to Grid) not being set correctly for your monitor and chosen screen resolution; the issue is that "1 pixel" according to the WoW UI no longer aligns with the physical pixels in your monitor. I don't remember offhand how to determine what the correct settings are, since it's been 2+ years since I logged into the game for anything other than addon development, but searching the forums for "pixel perfect ui scale" should find you some suggestions. Hey Im trying to setup my grid but somehow it keeps doing double pixel borders where I only want it to be 1 pixel border. Anyone know what causes this? Cheers! I'll look into it! Hi, sry if it is alrdy known but Raidframe isnt working. Grid shows only the 1st group of the raid, if u do a /reload ui then the whole frame disappears. Raidlayout is set to group. Is this known ? I'm getting bugs when logging into Dalaran relating to the "LibResInfo" library found in Grid (at level 110 in BFA). EDIT: I found your GitHub LibResInfo project page and submitted this as an issue there too. Last edited by Mayron : 08-14-18 at 10:24 AM. After update to 8.0 grid is no longer completely shown in raids, only one group is seen. Re-installing or resetting all options does not have any effect. Last edited by soest009 : 08-12-18 at 03:46 AM. I think you might have posted on the wrong page. The screenshot you posted is of the default unit frames, which have nothing to do with Grid, the addon this page is for. If you did mean to ask a question about Grid, please try to explain more what you're trying to do. Hey Guys! 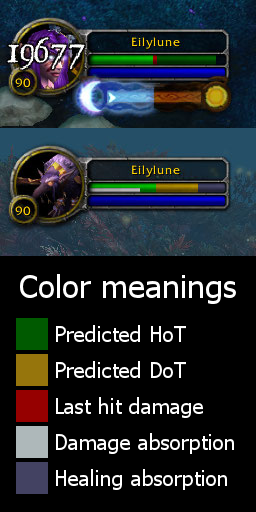 someone here knows how to set it up to show hots, dots, etc like the next image? When downloading the zip directly, this will happen, just remove the "-master". You will want to copy your current (before replacing) versions 'AddOns/Grid/Libs' directory into the new version. Sorted, thank you very much! Can you help a noob out? I've downloaded your folder Grid-master and Grid-Extra-master but I'm not exactly sure what I should be doing. Should I leave my old Grid folders in AddOns? Or should I delete those completely and just use Grid-master? Last edited by attict : 07-22-18 at 02:21 PM. Hello, anyone have a grid version functional ? Thank you Phanx for your reply, hopefully someone pick up the project and help. To be honest, even though Grid may need more options and tweaks, I feel that as a long user it is giving me all what I need from a healer PoV, considering that it has been working wonderfully during the current patch. Sadly I lack programming knowledge else I would help without hesitation. I bookmarked the untested files, will test them as soon as I get beta access or much later when patch goes live.